Upon arriving, Sarah and Jack are welcomed by the family Jack left behind all those years ago. But as facts about Julia’s accident begin to surface, Sarah realizes that nothing about the Quinlans is what it seems. Sarah dives deep into the puzzling rabbit hole of Jack’s past, but the farther in she climbs, the harder it is for her to get out. And soon she is faced with a deadly truth she may not be prepared for. 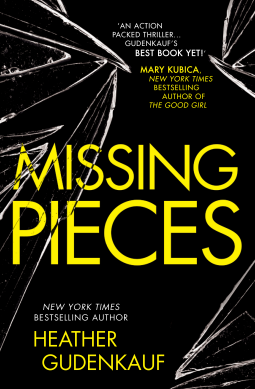 Right from the beginning Missing Pieces sucked me in. From an idyllic country setting to a sinister murder in the first few pages. And when we cut to Jack and his wife Sarah, it doesn't add up. Jack is not telling anywhere near the truth of that day, and Sarah has long been kept in the dark. A long time, because they have two college age daughters. 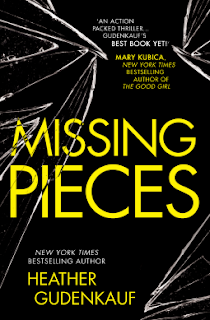 When they return to Iowa because Jack's Aunt Julia is lying in hospital after a fall down the stairs, Sarah begins to find little cracks appearing. She realises Jack has kept her very much in the dark. He's told Sarah his parents died in a car crash. And as the reader you know that's untrue and have to ask - why? Just as Sarah does. Then there is his sister Amy, who is having problems, seems highly anxious and unhinged. As well there is Jack's cousin Dean and his wife Celia, and aren't those two just another little item that Jack has been keeping quiet about. It's all very creepy and suspicious. So who has done it? Who has murdered Jack's mother? And what of Aunt Julia. Accident or Murder? We definitely know "that something is rotten in the state of Denmark Penny Gate, Iowa". Sarah seeks the truth, all the time becoming more unsure of Jack and their marriage. As a journalist she takes risks and sifts through material that might give her clues. Can she do all that before the murderer strikes again? A few small clues are dropped but I have to say when the final revelation came I had not put that person at the top of my suspect list. This one had me reading on for sure, a creepy 'who dun it' that I raced through. Great review! I enjoyed Little Lies by Gudenkauf. I'm glad you enjoyed this. I love thrillers, but I haven't read Gundenkauf before- obviously I need to remedy that! I have really enjoyed Heather's books but this was my least favourite actually. I did think of the killer but couldn't think why and the body found is the weirdest thing to me. Starting over completely and lying, I get that, don't like it but understand but to go back when someone is unwell or for funerals is asking for trouble. Still a great read. Her debut and Little Lies are my favourites by her. I'm glad you enjoyed this one. I hate figuring out the 'who' before the end, and I've been hesitant to read this one, because of the mixed reviews. I think I'll still try it. Great review! I love this author's books, and I, too, hadn't figured out the "who" until the very end. But I know I didn't like that character...lol. Glad you enjoyed this one and that it kept you up, too. I literally sat with it until I was finished. Glad you enjoyed this one as I've read mixed reviews about it, but I do like her books and intend on reading it anyway. My fave title was One Breath Away. I raced through this one as well and didn't feel there were enough clues as to "who-dun-it." As a result, it fell a bit flat at the end. I loved Little Mercies and One Breath Away. I've had the opportunity to meet Heather twice! This is an author I've been wanting to read and this book has me the most intrigued of any of her previous books. I'm definitely looking forward to reading this one! Had fun with them in January! Nothing better to do! This sounds so good, I love twisty mysteries and this one definitely sounds like it fits the bill. I like being surprised and not able to figure it out. :) That's a long time to keep secrets and I like the idea of her having to sift through clues. I may have to read this one. This is the second favorable I've read on this in ONE day! Definitely going on my to-buy list!